So, Hesse. Not a name that's been heard around this blog for quite some time now. I was quite fond of his works, but after writing a 4000 word essay on a selection of his works I found myself a bit tired of him, oversaturated as I was at the time. After some time had passed, I found myself hankering for a bit more of his work, and I still hadn't gotten round to reading The Glass Bead Game yet. 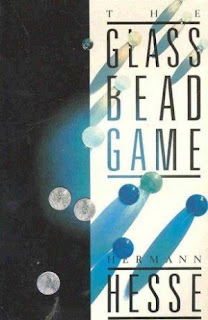 The Glass Bead Game is the story of Joseph Knecht, an elite academic in a province known for its intellectual prowess and mastery of the eponymous glass bead game. Set out as a biography of him following a mysterious scandal and subsequent death, it follows his struggle between maintaining the intellectual purity of the Castalian society that he has grown up in, and preventing it from becoming irrelevant in its detachment from the politics of the outside world. I wanted to like this more than I did. After feeling so moved by his writing in books like Beneath the Wheel and Steppenwolf, I had hoped that something similar would happen with The Glass Bead Game. As it is, I can appreciate it as a well-crafted critique of academia, but I'm not sure what appeal it would have to the everyday reader. I feel that part of the reason that The Glass Bead Game resonated with me emotionally was the biography format. Firstly, this means that the structure is a bit on the odd side. While you'd normally get world-building and side stories woven throughout the narrative, the structure means that the main narrative is preceded by a general history of the glass bead game, and appended by the collected writings of the main character. As such, Joseph's story doesn't begin until page 47 and ends on page 425 out of 558. While I can understand wanting to use a format like a biography for immersion purposes, but it does feel very strange and disjointed. Secondly, I found that the academic tone meant that at times it does get very dense and slow-going. If you're looking for a book that challenges you, then this probably won't be a huge problem, but I could see it being a barrier for those looking for something lighter or more traditional. For me personally, I found this more interesting in relation to the rest of his work, especially considering that my prior focus on his work was to do with identity and growth. If you're already a fan of Hesse's work, then The Glass Bead Game has some interesting parallels to other protagonists from his earlier work. I wouldn't start off with this if you've never read Hesse though, as it has a bit of a steep adjustment curve.